You never know what the weather holds. During transit, your shipment might have to face temperature extremes, and even rain and snow. 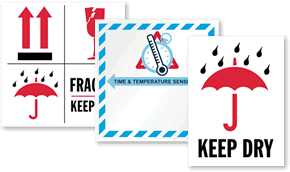 Keep Dry Shipping Labels point out proper handling instructions to make sure your packages are always protected against moisture and stored in dry conditions. • Widely recognized ‘raindrops and umbrella’ symbol reinforces your message. • Resilient, and easy to apply on a corrugated box, carton, shrink wrap, or plastic. • Acrylic adhesive backing ensures labels won't peel off. • To mark the same message on several large boxes without dealing with a label, you should try our reusable stencils below. To see our full range of Keep Dry Shipping Stencils, click here.